Queen's speech at Belfast City Hall Jump to media player In a speech to guests at a civic reception in Belfast City Hall, the Queen has praised those who have helped 'turn the impossible into the possible' in achieving peace in Northern Ireland. Queen resists lure of Iron Throne Jump to media player The Queen and Duke of Edinburgh visit the set of HBO's Game of Thrones, on the second day of their visit to Northern Ireland. 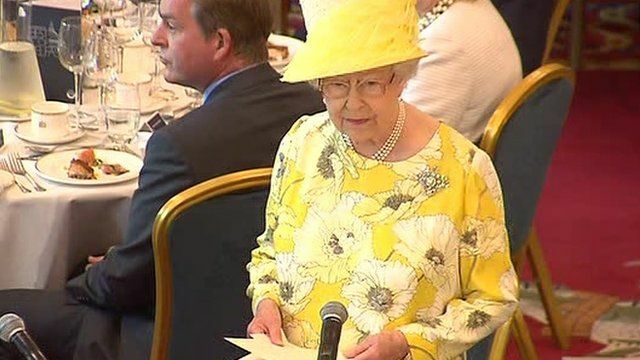 In a speech to guests at a civic reception in Belfast City Hall, the Queen has praised those who have helped 'turn the impossible into the possible' in achieving peace in Northern Ireland. She also paid tribute to the hard work and dedication that has helped reshape the city of Belfast.